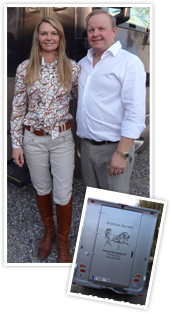 As Arabian horse breeders for over 20 years, Christel and I are truly grateful to be able to continue our family’s legacy of great horses and to see our children, Jesse & Danté, take that legacy into the next generation! A long term vision of breeding helped us to produce consistant International champions, you are as good as your last winning champion, every year is a new start, hypo mating is a daily study in the race to find that next winning combination. If we can be a part of your next champion, don't hesitate to contact us !